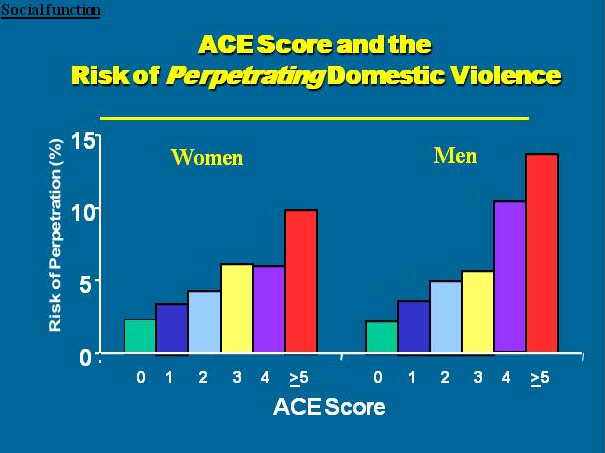 Family Violence: How it impacts Children and causes Inequality | Is your ACE score more than 4? What does that mean? 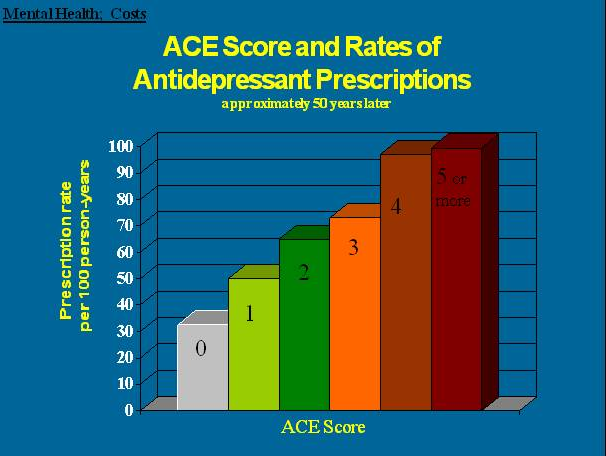 Is your ACE score more than 4? What does that mean? 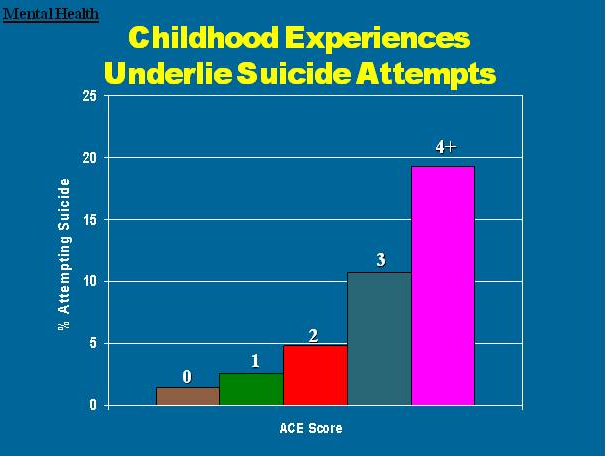 In my previous post I explained that the ACE questionnaire focused on the effects of complex traumas rather than a “one off” traumatic experience. 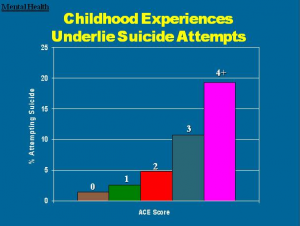 Research has shown that the more times a child is exposed to a traumatic experience the more severe the impact it has on their life. 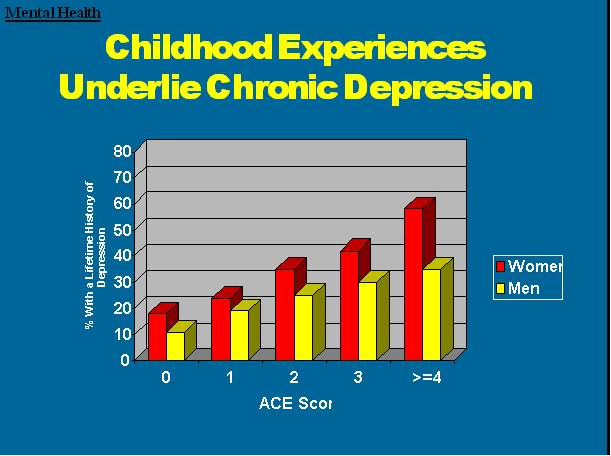 The following charts are the possible impacts and negative health implications identified by the ACE’s research. 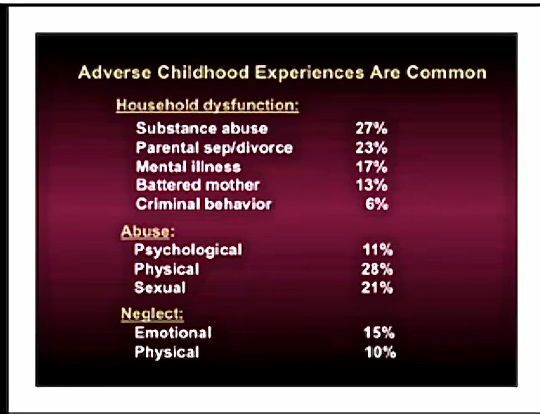 The chart above looks at the most common forms of adverse experiences children can face. The most common form of household dysfunction is substance abuse followed quite closely by parental divorce or separation. 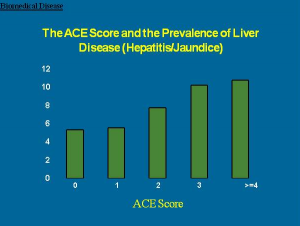 Now remember that the ACE score and inequalities it causes relates to a combination of adverse reactions not just one thing. 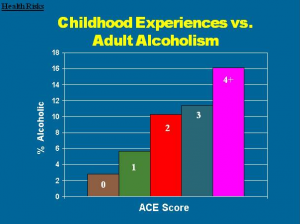 People with an ACE score of 4 or more are 16% more likely to have issues with alcohol as an adult. 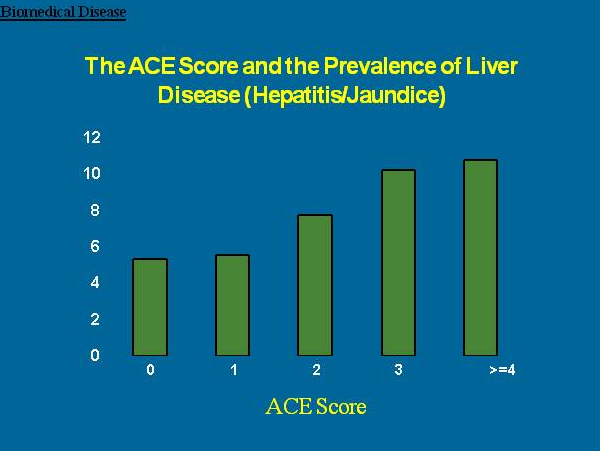 Adult alcoholism is strongly related to the prevalence of liver disease. 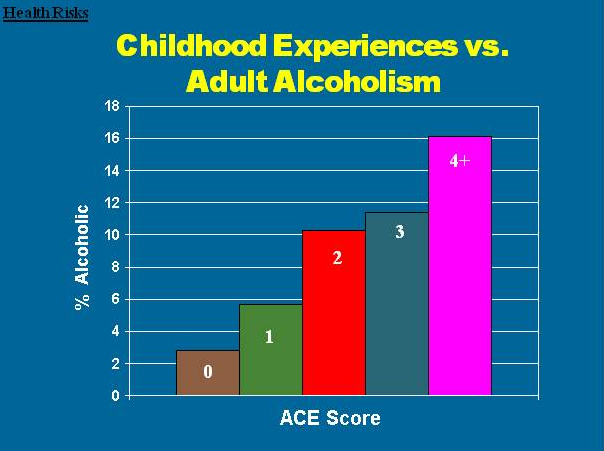 A high percentage of adults who experience alcoholism issues start using alcohol as a way to self medicate and relieve their stress while in their teens. It becomes a mal-adaptive coping mechanism, which in turn creates issues with the health of their liver. 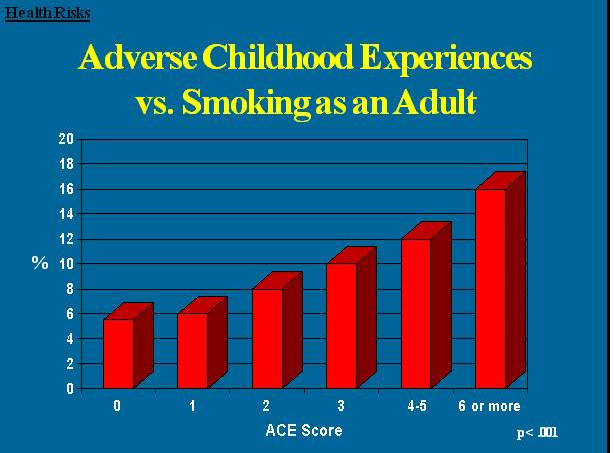 Having an ACE score of 4 or more means that people are 17% more likely to smoke as an adult. 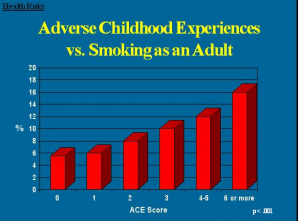 Smokers report that nicotine reduces their anger and improves their focus. The adverse health effects from smoking are chronic lung conditions such as asthma, bronchitis, emphysema and of course lung cancer not to mention all the other adverse health conditions related to smoking such as stroke and heart disease. Children who witness domestic violence are 10% for females and 14% for males more likely to become the perpetrator of domestic violence as adults. Females also tend to find themselves being an adult victim of domestic violence and quite often find themselves with multiple violent partners in their life. 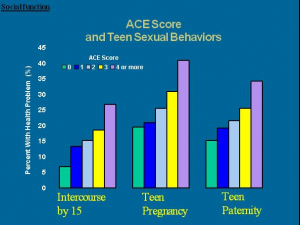 As you can see from this chart that the instance of teen pregnancy is 40% more likely in people with an ACE score of 4 or more. Those statistics are quite high and of that 40%, roughly 35% of those go on to be Teen parents. 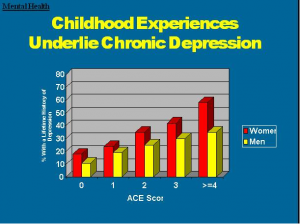 I find these statistics quite alarming with over 55% of women and 35% of men with an ACE’s score of 4 or more experiencing chronic depression. You can see here that there has been quite a significant increase in the prescription of anti-depressants. Although the rate is quite high, this can be seen as a good thing as people are actually seeking help for their depression and anxiety, wouldn’t you agree? I also find these statistics quite sad and although it appears that people are asking for help with their depression, these statistics show the high proportion of people who attempt suicide. 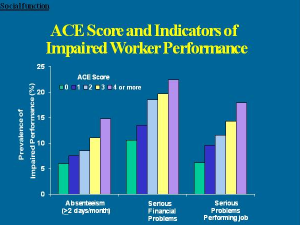 There was no direct information on this graph, there could be a number of outside factors contributing to these statistics about poor work performance. What do you think they could be? 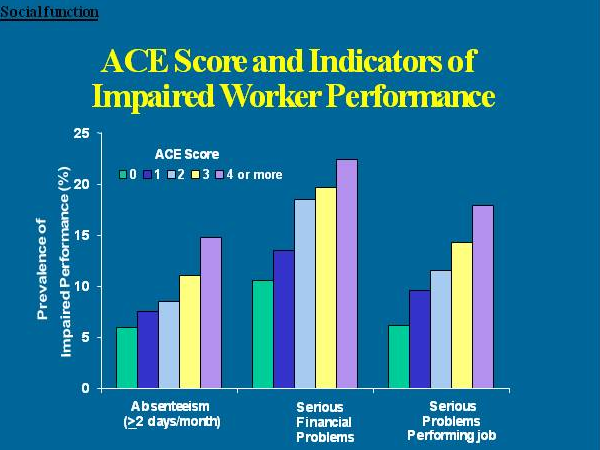 As a person with an ACE’s score of more than 4, I have personally experienced many of these and know many people who fit within these statistics. What about you, do you agree with the research? I feel I got a bit off topic in this post and jumped to adult issues of childhood trauma, but will get back on topic in my next blog, but ask you to think about graph 5, which looks at domestic violence, do you think that this perpetuates the cycle of abuse?